Facebook/OfficialStephenKingPictured: The tortoise and the hare. 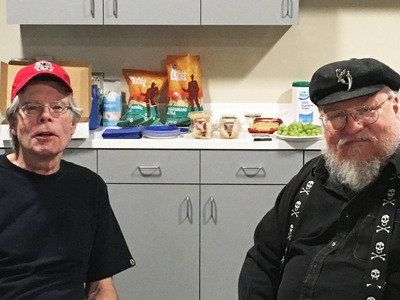 George R. R. Martin is the author behind the “A Song of Ice and Fire” book series that the smash hit TV show “Game of Thrones” is based on. He’s also an infamously slow writer (fans have been waiting for the next book in the series for upwards of five years). Thanks to everyone who turned out in Albuquerque last night, and special thanks to George R. R> Martin, who stole the show. “I have a good six months and crank out 3 chapters, meanwhile you wrote 3 books in that time!” Martin said, according to Redditor jmsturm. As of posting, “The Winds of Winter,” the sixth out of seven planned books in the “A Song of Ice and Fire” series, does not have a release date.